Recognized as one of Hawaii’s most versatile musicians, Jeff Peterson is at the heart of the Hawaiian music scene today. His passion for the guitar has allowed him to shine as a solo artist and has given him the opportunity to collaborate with a wide variety of artists from Hawaii, across the US, and abroad. His focus on slack key guitar, classical, and jazz music has allowed him to develop a unique and transcendent voice on the guitar while being deeply rooted in the traditions of his Hawaiian heritage. Born on the Island of Maui, Jeff Peterson grew up on the slopes of Haleakala where he was introduced to the rich heritage of Hawaiian music by his father, a paniolo, or Hawaiian cowboy, on the Haleakala Ranch. He has contributed to two Grammy Award-winning recordings and has been honored with four Na Hōkū Hanohano Awards in Hawaii. 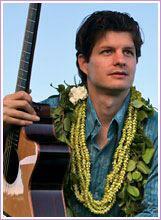 His solo CD Maui on My Mind was recognized as the Slack Key Album of the Year in 2010. His next release featured his songwriting, performing, and producing on Amy Hanaiali`i and Slack Key Masters of Hawaii. The groundbreaking recording features a collaboration between Jeff, Amy Hanaiali`i, Cyril Pahinui, Dennis Kamakahi, Sonny Lim, and Chino Montero. His latest release titled Slack Key Travels includes twelve new compositions and new arrangements of classic Hawaiian songs and won the 2014 Hoku Award for Best Slack Key Album.